The Norwegian double bassist, Thomas Winther Andersen, who has lived most of his adult and hence also professional life in the Netherlands has on a number of previous occasions emerged as a unique talent. He is really sticking his neck out with this duo recording, being assisted only by drums. We are pleased to announce that he has survived on all counts. Previously, we have, almost inevitably, come across the emigrated Mr Andersen in rather larger arenas. This has resulted in a considerably less prominent role than is the case here, but whatever the setting where Thomas Winther Andersen has appeared, he has convinced us that the great native country has fostered a very high class musician, now stationed in clog-land. What he ventures into in “Too Much Bass?” is a calculated risky voyage. It is no exaggeration to call this exposure of his double bassist heart and soul with only percussionist support courageous. However, there is a lot of evidence that Winther Andersen has been in relatively good control of what he has set out to do. This is a musician with a very good insight into his instrument’s possibilities and whose technique is supreme, with a tone that is deeply personal. Winther Andersen shows that he has great command over the different jazz genres and contributions made by important jazz personalities. “Waltz for Debby”, immortalized by Bill Evans, John Coltrane’s qualifying work “Giant Steps”, double bass guru Charles Mingus’ cunning tribute to Lester Young’s “Goodbye Port Pie Hat”, and the Latin classic “Black Orpheus” are the imported pillars. Winther Andersen has written the remaining pieces, including the title track in three parts. Even if parts of this material are well-known, Winther Andersen takes great liberties both rhythmically and form-wise, also the meters change a number of times within the same number. The total effect creates new moments of suspense and we can “hear” that Winther Andersen takes the time to reflect where he wants the music to go. He is assisted excellently in this by his “fellow countryman” Chander Sardjoe. It is clear that these two have a close relationship: they know intuitively where and when they should let the other one in and how they shall direct their teammate to new paths. Sardjoe is an exciting and particularly attentive and musical percussionist and the perfect partner in this duo context. One of the ideas behind the recording was to set new limits for the double bass as a solo instrument. 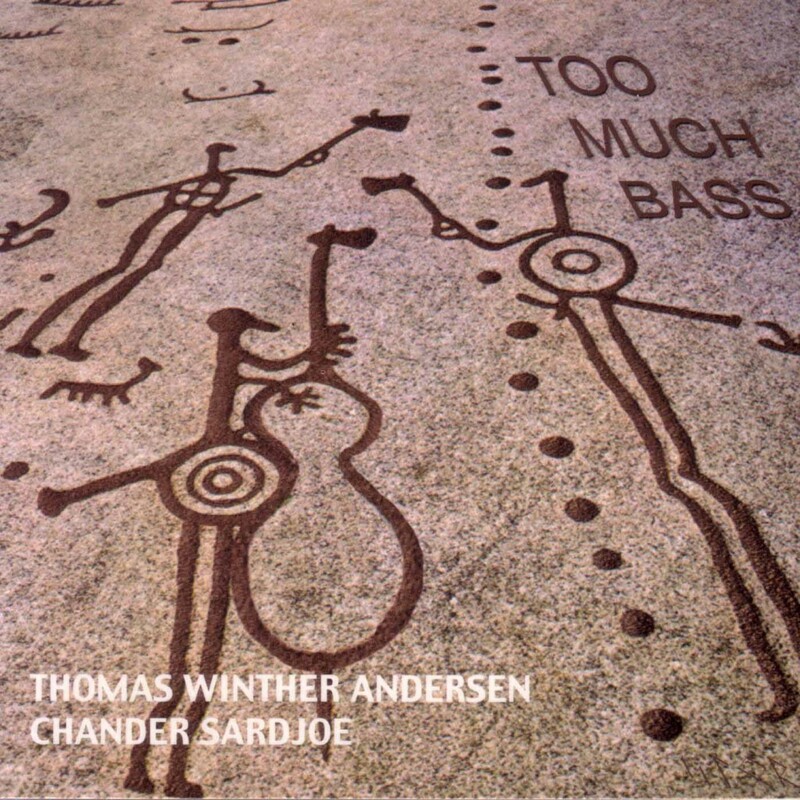 Thomas Winther Andersen has certainly succeeded in doing so and the only answer to his rhetorical question “Too Much Bass?” has to be: Not at all! Keep up with the bass Winther Andersen.